Below is a guest post by my niece, Sarah, who recently went to Cuba as part of an educational trip. I think you’ll enjoy her story and photos. My name is Sarah and I have been teaching English as a Second Language to students from all over the world, in urban schools in upstate New York for the past 16 years. International traveling is my passion. It began when I was an AFS exchange student to Japan from the end of my junior year to the beginning of my senior year of high school. The traveling bug got into my blood and I am unable to stay stateside for any length of time. After Japan, I continued by attending a college semester in Quebec (as my minor was French) in my sophomore year and a semester in Salamanca, Spain in my junior year (as I graduated with a Bachelor of Arts degree in Spanish). While in Spain, I spent time in Portugal. My next excursion was several weeks on a group tour in England, Scotland and Wales. As part of a professional development project on the Renaissance, I was part of a group of teachers from the high school in which I work, that traveled to Italy, concentrating on Rome and Florence. A friend and I explored Austria one Spring Break and I was fortunate enough to accompany my sister and brother-in-law to South Korea to complete the adoption of my youngest nephew, Levi. In February of this year, a teacher from the high school in which I work, decided to take a trip to Cuba. This is not an easy task due to the embargo between the U.S. and Cuba. So she organized a group trip for educators. After all was said and done, we ended up with a group of 10 women, consisting of five of us from the high school, an elementary principal in the district, an ESL teacher from another district, her cousin, the neighbor of one of the high school people, and my mom! (See Rose’s Trip to Cuba) Many people asked why we didn’t just fly out of Miami…did I mention the embargo? We had to fly out of Canada because Canadians can easily fly in and out of Cuba as relations between the two countries are friendly. First of all, there were a lot of misconceptions as to what I was told before leaving the U.S. Yes, it is a communist country, but Raul Castro has really done a great deal to improve and modernize Cuba in a reserved and appropriately transitional fashion. It is a beautiful country with warm sweet people who bring about a myriad of emotions with each turn of a corner. People waiting for a ride, under a bridge to nowhere. So what is my first response when someone asks me, “How was Cuba?” The people may be the sweetest I have ever encountered, as a whole. Driving on the one highway that runs the length of the country, one will encounter many carts being pulled by oxen or horses, or by bicycles. If one encounters a slow vehicle, you simply toot your horn. The driver then pulls over and you both wave and everyone continues their day. Yes, why do we New Yorkers get so angry when someone wants to drive faster than us? Because we have too much!! Just looking at the humble homes along the highway and the difficult but usual work being done by oxen drawn carts, makes you really wonder if it matters if someone wants to drive faster than you…not a bit!! Every bridge to nowhere that you drive under, has large groups of people waiting for someone to stop and pick them up and take them on their way. Yes, this is a common practice as there is no public transportation outside of the city. Is it safe? YES!! Rules are obeyed as a result of governmental control. I still think of the camaraderie and general good nature of the Cubans when someone cuts me off in traffic. We are so lucky with all that we have in the U.S. and don’t even know it. That is more important. This is a “yellow person”. If a “yellow person” sees a government vehicle pass under a bridge to nowhere and pass a group of people waiting for a ride, the driver receives a ticket/fine from the “yellow person”. The government vehicle is supposed to offer people rides if they are going the same direction. Probably the next most important topic is drinks in Cuba. So let me introduce you to Havana Club. One must become familiar with this word because it is everywhere. Havana Club is Cuba’s rum. Yes, the factory where it was originally made, still stands although the building is now used for other manufacturing and Havana Club is now made in another part of the country, but I digress. The mojito is everywhere and is pretty cheap. Many establishments have their own twist on it, but it is basically a sprig of mint, Havana Club, some lemon-lime soda, and a squeeze of lime. Some put a little sugar in it to sweeten it; some use sugar cane. There is a different drink that is similar, made with basil instead of mint and honey instead of sugar. In my opinion, I never had one I didn’t drink!! There are also piña coladas, but they are not as sweet as we are used to. (Throughout the world the U.S. is known for things being more sweet than anyone else could imagine.) The daiquiris are not fruit flavored, so again, they are not as sweet as ours. But again I say, I never had one I didn’t drink!! I also got the opportunity to experience a Malta, which I have heard about for years, from my native Caribbean ESL students. It is what we would consider a soda, made from molasses and/or pure sugar cane. There is an option to add milk, which is actually sweetened condensed milk (the thick canned milk used in baking as a sweetener and/or thickener). I ordered mine without milk and it was pretty sweet. This drink requires a fermentation process, although it is non-alcoholic. I also got to see a guarapó being made. Again, my students talk about how much they miss this typical drink and I finally got to try one. It is made by squeezing the liquid out of sugar cane through the use of a press. It was not as sweet as I expected, but extremely refreshing and unforgettably delicious. The sugar cane is fed into one end (right), the gentleman flexes his large muscles to work the handle on the wheel to press the cane and out comes the liquid/pulp on the left, into the pitcher. He then brings a glass full of ice to your table and pours in the contents of the pitcher. Delectable!! Now, we cannot forget about the Cuban coffee. It is not allowed in the U.S. (remember the embargo?) so most of us have never even heard of it. Cuba was once known for its coffee though. It is delicious!! It is most often served after a meal as more of an espresso, but it is delicious any way it arrives to the table. 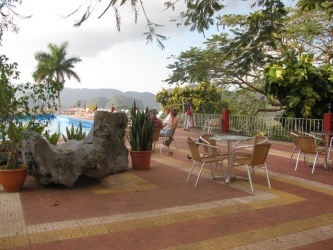 One famous coffee shop called Café de Maria (in Las Terrazas) serves a Green Mountain that I cannot get out of my head. It is a cup of coffee with a big scoop of shaved ice that has been drenched in mint liquor. I am going to try this myself, but I can’t imagine it will taste the same without Maria overlooking us, and the view. Maria is the founder of the café, and she gave coffee to the coffee plantation workers even though she wasn’t supposed to. She believed that if they did all the work to produce it, they should get to enjoy it too. She is older now, but she watches her patrons enjoy their cups, from an overlooking doorway. Next is the food. I was told that it is “bland”. Granted, I love rice, but I thought the food was amazing!! One will often find white rice (not sticky rice like in many Asian countries) with black beans in their sauce to be poured over it. I cannot describe the flavor of the beans, but it is amazing. It seems that each restaurant has its own recipe for cooking the black beans, all of which are wonderful. We had fish several times, both fried or in paella (yellow rice with seafood [in Spain] but different types of fish and shrimp, etc.). The tapas (appetizers) were varied and different but seemed familiar, from pork rinds to plantains. Yuka (similar to a potato, but they translate it as a sweet potato, although not what we think of as a sweet potato) is very common, including for breakfast. Again, they were cooked and flavored in different ways, all of which I enjoyed. There is often chicken. If you go to a government-owned restaurant or hotel restaurant, you can get beef. Why am I being so specific? Because cows and milk belong to the farmer. The meat belongs to the government. If one kills a cow (including by mistake if one is crossing the road, which is common) the police must investigate and all involved parties must remain until it is determined whether it is the driver’s fault for driving too fast or the farmer’s for not keeping them secure. It usually ends up being the driver’s fault. So one should wait until the cow decides to cross…however long that takes…and however long traffic builds. But what if someone kills a cow? Our guide very casually said, “He must go to jail for 10 years.” On a more relatable note, people can now visit paladores (privately owned restaurants, thanks to Raul). These are created in old houses and are amazing!! I would definitely try as many as I could if I visited again. They are obscure when walking the side streets so knowing where they are ahead of time is vital. As far as the beauty, I don’t even know where to begin. The beaches have white sand, with the picturesque turquoise that turns to darker blue as it approaches the horizon. Outside of the city you can see mango, avocado, and banana trees everywhere. The flowers are in bloom even in “winter” which is February and everything is lush and green. It is a tropical climate, so it is hot and beautiful every day. (Well, at least it was when I was there.) Apparently the rainy season starts in April and there is a storm each day, followed by extreme heat and humidity. I didn’t experience this, but it sounds like picking the dates you visit, are pretty important!! Hen and her chicks at the hotel. Hemingway's House-friendly and patient tour companion. in the company of the hen and chicks. The white sand beaches are as magnificent as you would dream them to be. Nothing beats a sunset in the Caribbean!! Something else I found very interesting, is the way animals are treated in Cuba. In one very nice restaurant, as we ate our lunch, along wandered a peacock. No one seemed bothered by this and the waiters and waitresses moved easily around the bird. It did not seem to care about the humans and wandered freely around the establishment. Apparently this peacock is always there and perhaps even belongs to the restaurant. At our hotel in Viñales Valley (breathtakingly beautiful and a must see if you go to Cuba), there was a medium-sized dog who lived at the hotel. He waited in a common area and accompanied you (or whoever) on your walk between the lobby and your room. In the heat of the afternoon, he could be found on the roof of a wooden trullis, built as a canopy over the walkway, covered with purple flowers. When he got hot, he just sunned himself on the bed of flowers. He seemed well fed and happy. At the outdoor hotel restaurant, there was a hen and her baby chicks that wandered among guests and swimmers at the pool. There were animals like this in many places. Only a few seemed skinny, but most seemed content and comfortable around people. At Hemingway’s house, there is another dog (similar in size to the one in Viñales), who accompanies people on their tour of the grounds and patiently waits and sleeps on the cool cement-even when 10 women get together for a group picture and the poor photographer/tour guide is handed 10 cameras!! There seemed to be a familiar and comfortable relationship between customers/guests and the animals who live on the premises. All live together in unison and live a laid back, yet hard-working life. Why do we, here in America, look at animals so differently? Are we not all trying to eat and spend time with those we love and be happy? Now, if I were to pass on any wise advice, it would be about restrooms. Not many places have toilet seats and one must “pay the lady” to enter and receive a bit of toilet paper. Yes, I brought my own. Hotels and upscale restaurants are fine. Things are extremely cheap to purchase and we were told that we could not bring anything back that said “Cuba” on it. When we got to the American border, we were asked if we had “in writing” what we could and couldn’t bring back. Since we did, we were allowed to bring back everything but that which is prohibited: cigars, liquor, and coffee. If we had known, we would have brought back A LOT more souvenirs. My recommendation is if you get a chance to go to Cuba, forget the unfounded worries that ill-informed people try to scare you with. Grab a camera, some toilet paper, and an extra bag for souvenirs and go. You will never encounter a sweeter, more giving people, while enjoying delectable drinks and multiple daily mojitos all the while taking in breathtakingly beautiful scenery. Speaking of those classic Cuban mojitos, I think I’ll go make one right now!! To read “Rose’s Trip to Cuba” click here. canada, Castro, coffee, cuba, educational, embargo, Havana Club, hemingway, Malta, mojito, sarah, sugar cane, sunset, trip, vacation. Bookmark.